Currently operating private FM Radio channels in Mangalore are Radio Mirchi 98.3 FM and Radio Big 92.7 FM. Mirchi has stuck to its punch line ‘Sakhath Hot Maga’ as in Bangalore, which I feel does not reflect nativity. It could have been ‘Masth Hot Marre’ (definitely not Maraya, as people in other parts of Karnataka think that people living down the western ghats use Maraya in almost every line spoken). Anyway that’s just a brand building exercise. But with RJs too speaking ‘Bengaluru Kannada’, it is yet to catch up with the language here. Occasionally RJs do speak Tulu but it would have been better if it was exclusive in some of the programmes as it was the norm from Akashavani days here in Mangalore. In that aspect Radio Big 92.7 FM scores with it already roping in Devdas Kapikad, the veteran of Tulu comedy dramas (popularly known as Telikeda Bolli) in an one hour programme ‘Big Gadbad’. Big FM has also taken initiative to play local songs. I heard one of those Konkani songs. More initiatives like this to support local language and culture would be well appreciated and received with open arms. It would be nice to see these channels play old Tulu, Konkani film songs on air occasionally to remind us of the golden era in Tulu, Konkani cinema. Just rememebering one song from Tulu film, Pagetha Puge – pakkilu mooji onje goodudu badukondunduge, aitt onji kinnig renke puttondunduge, singardaanthi bangar thenes thikkondunduge, goodudu iththina samsaarogu santhasa unduge. With FM Radio channels coming to Mangalore, it is not just Mangaloreans who are tuning in. You will be hearing these channel being played in Udupi, Mulki, Bantwal, Puttur and Kasaragod as well, though with varying degrees of clarity. When I was returning from Mangalore to Bangalore few days back I could tune to Radio Mirchi 98.3 even at the Charmaadi Ghat!! Updates, 29th March 2008 : Third Private FM Channel in the form of Superhits 93.5 FM has entered Mangalore radio space on Feb 21st 2008. I would like to see healthy competition between the three private channels now. 93.5 is airing both Hindi and Kannada songs on equal basis. Incidentally, this is the 24th FM station in India and 2nd in Karnataka, by Sun Network. It expects to start operations soon in Mysore and Gulbarga in the coming days. The Sunday Indian (TSI) Kannada is now available online. Nice to see that the online version of the Kannada edition of The Sunday Indian is second of such kind in Indian languages after English. Note that the weekly is being published in 13 Indian languages (English included as Indian Prime Minister Mr.Manmohan Singh once said English too is an Indian language). Not often you will find such things happening for Kannada. You can access the TSI Kannada edition online by clicking the link below. What’s more – you can even find the old issues online if you had missed some and you can download the pdf files of the archived issues for later reading. Earlier I had mentioned in one of my posts about how TSI Kannada is becoming the undisputed no.1 weekly in Kannada with its coverage of wide range of topics from politics, sports, cinema, art, literature, opinion polls, finance and what not, with only seven months of publication. But only if it could change its English name to a native Kannada one, it would appeal to more Kannadigas, reach the rural areas in Karnataka and make an impact. One more aspect of the weekly is its bold stand on many of the contemporary issues, often unbiased. In this age of yellow journalism one could hardly find an honest media house as this one. Seeing the ads about Azaadi Express in Bangalore in leading news papers few days back, I had decided to go for the photo exhibition of the first war of independece in 1857 and freedom movement after that. This exhibition had been scheduled for 5 days, from January 23 to January 27, 2008 at cantonment railway station in Bangalore. I had missed the same train exhibition when I was in Mangalore few days back so did not want to miss this one in Bangalore. On Saturday, 26th January 2008, along with two of my cousins I headed for the cantonment railway station near Shivaji Nagar, being happy for the fact that I was there on Republic day for viewing our footsteps towards freedom. Sandeep joined us later at the venue. When we reached the railway station, it was 3 30 in the afternoon. Enthusiasm soon died when we saw the people standing in a very long queue to see the glimpse of the historic train. Public holiday on account of Republic day had a bigger role in drawing the crowds. Of course free entry for all too had its positive effect on that. To make things worse there was constant flow of people who would intrude into the long queue wherever possible, not even bothering about the people who had stood there for more than two hours. This is disgusting when the well educated intrude into the queue forgetting minimal ethics. With four of us standing in the queue time pass was never a problem or boring. We discussed a wide range of topics like physics, blogging, history and what not! The announcements came at regular intervals regarding the exhibition being open to general public only till 6 pm. It was already nearing 6 and we were not the ones who would give up and go back home after waiting for almost 2.5 hours. And when we finally got our chance and entered the train it was 6 in the evening. 12 coaches were filled with memories from the freedom struggle like quotes, photos, visual models, paper cuttings etc. With volunteers there asking everybody to move fast one could hardly grasp anything from our past. What is this; did we wait and waste our time just to walk fast in the train?? But we managed to take snaps of the material exhibited in some of the coaches. Frankly speaking it hardly mattered whether we entered all the coaches to have the glimpse since most of the coaches were decorated much in the same fashion as we used to do for school day celebrations for social science exhibitions!! Some of the coaches even had elementary models like irrigation pump and hydro electric power generations and in some other you would find Sania Mirza, MS Dhoni, Yuvaraj Singh and others trying to be the part of freedom struggle. For this Sandeep said it was because they had depicted nation building in the last 150 years. Then I thought more appropriate title should have been given to the photo exhibition. Some of the coaches had very good quotations, citations (like Macalay’s address to British Parliament on how to weaken India by disrupting the traditional education system here) and rare photographs(like handing over of power in 1947 and pictures from 1857) from history. Do spend your time in these. Photo highlights of the show were - pictures, maps from Ist war of Indian independence, Indian national flag over the years, Gandhian era, Netaji Subhash Chandra Bose's Azaad Hind Fauz or Indian National Army, The Hindustan Times reporting freedom in 1947, Pandit Jawaharlal Nehru becoming the 1st prime minister, prominent scientists like CV Raman, way of progress in Agriculture, Green Revolution (by MS Swaminathan), White Revolution(by Verghese Kurien), Hydro electric projects, Non Alignment Movement, Missile technology, Space technology, Indian currency over the years, war pictures, different models of Electronic Voting machines, Music maestros, sports heros. Also there were some audio recordings like Pandit Nehru's address to the nation on August 15, 1947. In the final coach there were books for sale which were on 1857, freedom movement, gandhian etc and other topics. Sunday, 27 January 2008 is the last day in Bangalore for Azaadi Express. Sunday being a holiday will draw crowds to the venue. So plan well to reach the venue in the morning itself to have the glimpse of history. And if you are planning to stand in the queue for more than two hours in the evening then it is not worth it as if it is in the closing hours you will hardly able to glance over the pictures. In our case we stood for 2.5 hours in the queue and finished seeing the exhibition in just half an hour with closing time of the show being extended. When Sandeep called me this Tuesday night I was in for a pleasant surprise. He was about to tell that my and his reviews of the film Gaalipata has been mentioned in thatskannada.com, one of the premier news websites in Kannada. Hurray! I was thrilled. Hurried to my laptop to check the article on the net. For those of you who are not familiar with thatskannada.com, it is one of the premier websites in Kannada featuring articles from top Kannada writers like Ravi Belagere, Pratap Simha, Vishweshwara Bhat and others and also covers a wide range of topics like news, cinema, literature, travel, cartoons, jokes etc. NO17 is LION if turned upside down. It seems Australia can not strike it and turn it upside down and be the King in the jungle of cricket. Invincible, as they were called twice in the last decade for their spectacular streak of 16 test wins has now become a thing of the past. It is the Indian cricket team again which halted the Aussie juggernaut yet again in 2008, first being in Kolkota, 2001. The unsung hero of Indian cricket, Anil Kumble proved his mettle yet again now on a different pitch with his captaincy. Engineer from Bangalore deserves appreciation and applause for lifting up the team from Sydney turmoil a week ago and making the right moves by bringing in Sehwag and Pathan. This combination of a batsman who can bowl and bowler who can bat turned into a pair of all-rounders and swung the match in India’s favour. Batsmen dismissed by same bowler in both innings – Australian openers Rogers and Jaques by Irfan Pathan, Australian skipper(and Harbhajan’s bunny) Ricky Ponting by Ishanth Sharma, Andrew Symonds by Anil Kumble, Mike Hussey by RP Singh. Test over in 4 days - A team beating Australia in a test within 4 days, which usually happens other way round. Indian Tail wagging 30% – both innings put together last 4 wickets producing 180 out of 624 total runs scored, making it close to 30%. Relatively Safe Hands – India held 14 catches in total to affect as many number of dismissals, with less dropped catches,one famous being off Symonds by Sachin. I have been a big fan of present Indian skipper, Anil Kumble, right from the days of Hero Cup in 1993 where he displayed magnificent spell of bowling on the final of Hero Cup on 27 November 1993 to record a famous win against the West Indies. Till this day, 6/12 remains Kumble’s best figure in ODIs. His figures on that day read : 6.1-2-12-6 with 5 victims getting bowled!!! In the dusk of his 17 year old cricketing career he has achieved another feat by becoming only the 3rd bowler in the history of cricket to take 600 wickets in tests. But he has been far away from controversies the other two had been involved with, whether on or off field. I always wondered why he was not given captaincy after Azharuddin left the spot. In fact he was the vice captain when Azhar was skipper. For the true ambassadors of the game like Kumble these issues really don’t matter. He was always a captain in the waiting. This has been proven yet again after this victory. His dedication, temparent, accuracy, team spirit should serve as good examples for many generations to come. January 12th is Swami Vivekananda's birthday. This day is being celebrated as Youth Day in India. Lots of literature have been dedicated on this great man of modern India. But these are the words from him which even today inspire millions to try hard and attain their goals : "Arise, Awake, Stop Not Till The Goal Is Reached. " This is a series on unexplored beaches in Mangalore. As such these beaches are being frequently visited by only locals but never got developed into full time tourism destinations. In that sense none of the beaches in Karnataka coastal region caught the attention of domestic or international tourists. Karnataka tourism department have a lot to do if they want to convert these into tourism destinations and boost the economy of this region. First one in this series is Someshwara beach, 13 kms from Mangalore city and 3 kms from Ullala. Someshwara beach is a tourist’s delight. Those rocks near the sea, those coconut plantations facing the sea and of course clean surroundings make it a perfect spot for the photo enthusiasts and nature lovers. You will surely agree after seeing the photos I have included in this post. The place is most frequently visited by Mangaloreans to get relieved from the mechanical way of life in the city. If you are film buff you might notice that this is the place where some of the popular Kannada films were shot. Most precisely on the rock called Rudrapaade song sequeces, romantic scenes are shot. There is lot of scope for improvement for making this place a prime tourism destination. There is only one beach resort called Summer Sands, 2 km away from Someshwara. In one of the programmes on DD9 or Chandana (Kannada TV channel owned by Govt.) about tourism called Thaana Yaana, one of the European tourists here revealed that Karnataka is not much known in the Europe for tourism and there is a need to market this region for the same. This should serve as a eye opener for the tourism department to wake up and take necessary steps. Historically, this region, Ullala was ruled by Queen Abbakka. She is the one who started the battle against the Europeans in this part of India. She fought and defeated the Portuguese. In her honor there is a statue of her on way to Someshwara. There is Somanatha temple on the sea shore from which this place derives its name from. Presiding deity here is Somanatha or Shiva. In the temple premises there is the statue of great sage Parusharaama. As per mythology, the coastal region of Karnataka was the creation of Parusharaama (as they say in Kannada it is Parusharaama Srushti). So next time you visit Mangalore don't forget to visit Someshwara beach. 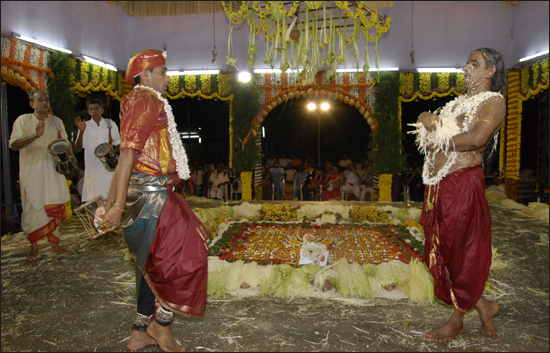 Here is how you can reach Someshwara?